In 1275 Edward I called a meeting of Parliament (parler was Norman French for talk). As well as his tenants-in-chief, Edward invited representatives from every shire and town in England. These men were elected as representatives by the people living in the locality. When the representatives arrived they met in five different groups: (1) the prelates (bishops and abbots); (2) the magnates (earls and barons); (3) the inferior clergy; (4) the knights from the shires; (5) the citizens from the towns. At these meetings Edward explained about his need for money. Eventually the representatives agreed that people should pay the king a tax that amounted to a fifteenth of all their movable property. It was also agreed that a custom duty of 6s. 8d. should be paid on every sack of wool exported. As soon as agreement was reached about taxes, groups 3, 4 and 5 (the commons) were sent home. The representatives then had the job of persuading the people in their area to pay these taxes. The king then discussed issues such as new laws with his bishops, abbots, earls and barons (the lords). After this date, whenever the king needed money, he called another Parliament. In 1430 an Act of Parliament divided constituencies (voting districts) into two groups: counties and boroughs. Only males who owned property worth 40 shillings were allowed to vote in county constituencies. You had to be fairly wealthy to be a MP. Not only were MPs not paid a wage, they also had to have an annual income of £600 (£300 for borough MPs). Whereas Parliament stipulated who should vote in county constituencies, each town was allowed to decide for itself how its MPs should be selected. Voting qualifications varied enormously. In Preston every man over the age of 21 could vote. However, in most boroughs only a small number were allowed to take part in elections. In some constituencies, MPs were elected by less than ten people. Henry VIII enhanced the importance of Parliament by his use of it during the English Reformation. In 1547 the king gave permission for members of the commons to meet at St. Stephen's Chapel, in the Palace of Westminster. In the 15th century the House of Lords was the Upper House and the House of Commons the Lower House. However, since that date, the balance of power has shifted in favour of the Commons. 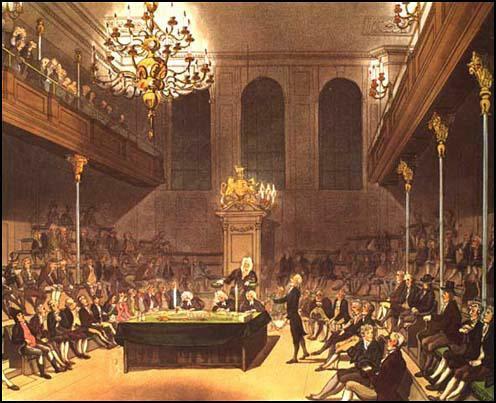 After the Act of Union in 1800 the number of members in the House of Commons increased from 558 to 658. There were 465 MPs from England, 48 from Wales, 45 from Scotland and 100 from Ireland. This created problems of space as St. Stephen's Chapel only had 427 seats. In 1834 the chapel and most of the Old Palace of Westminster was destroyed by fire. The new Palace of Westminster was designed by Sir Charles Barry and Augustus Welby Pugin. The seats to the right of the Speaker's Chair are traditionally used by the Government and its supporters, and those to the left are used by the opposition and other parties. Senior members of the Government and the Opposition sit on the front benchers. The gangway separating them is known as the Floor of the House, which was designed to be "two sword lengths apart". The House of Commons meet Monday to Thursday from 2.30 pm. to 10.30 pm. and on Fridays from 9.30 am to 3.00 pm. However, sometimes debates went on all night. By John Simkin (john@spartacus-educational.com) © September 1997 (updated December 2018). Parliament meets in the King's old palace. St. Stephen's Chapel, formerly the royal chapel of the palace, but lately beautified for the convenience of the House of Commons, was a very indifferent place, old and decayed. The House of Commons is plainly and neatly fitted up, and accommodated with galleries, supported by slender iron pillars, adorned with Corinthian capitals and scones. At the upper end, the speaker is placed upon a raised seat before him is a table, at which the clerk and his assistants sit. Just below the chair, and on each side, the members seat themselves. The speaker and clerks always wears gowns in the house. 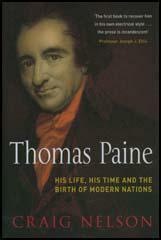 What is government more than the management of the affairs of a Nation? It is not, and from its nature cannot be, the property of any particular man or family, but the whole community. The House of Commons is like a church. The vaulted roofs and stained glass windows, the rows of statues of great statesmen of the past, the echoing halls, the soft-footed attendants and the whispered conversations, contrast depressingly with the crowded meetings and the clang and clash of hot opinions he has just left behind in the election campaign. Here he is, a tribune of the people, coming to make his voice heard in the seats of power. Instead, it seems he is expected to worship; and the most conservative of all religions - ancestor worship. At Westminster, through everything, the Mother of Parliaments remained, a prime target, easily distinguishable, beside the river. The House of Commons Chamber was destroyed: a bomb fell the same night (10 May 1941) through the roof of the Lords, not far from their Chamber. The Palace of Westminster and precincts were hit by ten high explosive bombs, one oil bomb, and many hundreds of incendiaries. St. Thomas's Hospital, across the river, was hit many rimes. Almost every building in sight beside the river was wounded. One morning I left Westminster Pier and saw large holes in the eastern face of Big Ben. But the Speaker was still in his fine house by the Bridge. For the most part, true, they sat during the hours of daylight only: but the doodle-bugs were not afraid of daylight. It was a pretty grim place to work in, too, during the war. The 'black-out', in such a building, was an almost impossible problem. A few hurricane-lamps on the floor were the only lighting of the great Central Hall, and they made it a lofty tomb of gloom. All the windows went in the early blitzes: the east side was all cardboard and sandbags, and you could not see the river from the Smoking Room. On the terrace was a Guards machine-gun post (of which I went in fear many nights on patrol, in the early days, when E-boats were expected in the Strand). Our favourite pictures and tapestries were taken away, and left depressing gaps. The Harcourt Room was full of beds for the A.R.P. : the lower corridors were anti-gas refuges. The Smoking Room closed earlier - very rightly - to let the staff get home before the blitz. And all the time there was the feeling that the things that mattered were happening elsewhere - a strange sad feeling for the proud M.P. and law-giver. It was pleasant enough for me, after a long voyage up the river from Canvey Island, to pop into the Smoking Room in the evening, hear the gossip and have a drink (if there was any one left), to dart in now and then, with special leave from the Navy, and make a speech about this or that. But I could not have endured to be there all the time: and I honoured those who were. There can surely be no other career both so flattering and so frustrating as that of a Member of Parliament. I left my constituency after my election with the feeling that I was nearly as important as people there believed me to be. My maiden speech received a whole column in The Times and, as far as I remember some mention in its leader column. Mr. Churchill was one of those who went out of his way to congratulate me. I had been less nervous than I had expected. I seemed to have my foot on the marble staircase that leads up to the Secretary of State's room on the first floor of the Foreign Office. But a maiden speech is relatively easy, for the Speaker lets you know when he will call you, the tradition of the House is against any interruption, and the following two members are expected - though politically they may hate your guts - to say nice things about your effort. I should have enjoyed the House of Commons more if I had never made a second speech. For, during the second and subsequent speeches there is always the probability that some opponent will leap to his feet with an interruption. You are not compelled to give way, but it is unwise not to do so. His interruption may be irrelevant an idiotic, but it probably succeeds in breaking the thread of you thoughts. If it becomes obvious that it has done so, you may anticipate a whole series of interruptions the next time you catch the Speaker's eye. Even if they are not made, the anticipation of them reduces the confidence with which you face the most difficult audience in the world. If you speak from a platform, the chances are that you are addressing an audience that has come partly or wholly in order to hear you. Its members may be hostile or critical, but at least they are likely to be attentive. Not so in the House of Commons This is what happens, and the procedure would seem to have been designed, purposely and probably wisely, to take the fire out of any debate. For many years my special subject had been foreign affairs might, therefore, expect that, in a two-day debate on it, I should have an opportunity to say my piece. For two or three day before such a debate, I draft notes or, perhaps, write out the entire speech in the hope that, by so doing, I shall learn most of it by heart. As soon as the debate begins, I go round to the Speaker's chair to request that my name be included on the list of would-be participants and to ask what are my chances of being called. The first disappointment - Mr. Speaker shakes his head doubtfully. There are already five Privy Councillor down, and they take precedence over ordinary members. The Foreign Secretary wants an hour and a half, and his leading opponent will take at least an hour. There is one maiden speech and twenty members, each as convinced as I am that he has something of value to say, have already approached him. If wait patiently, there might be a chance when everybody have gone off to dinner.